Lanie's Little Learners: Summer: A Time for Relaxation and Getting Ready for Next Year! Summer: A Time for Relaxation and Getting Ready for Next Year! Summer vacation is well underway with only 24 more days until the start of the new school year. As always I use summer vacation as a planning time like so many. Summer vacation is also a time to reflect on things that went really well and things that just plain flopped. I have realized that behavior is the biggest obstacle any teacher faces. Today’s society is so geared to hit first, ask questions later. More and more of my students are using their hands instead of their words. This makes me so sad. SO, in retrospect I have decided to use Conscious Discipline (www.consciousdiscipline.com) in my Pre-K classroom this year. I have spent countless hours researching and coming up with activities to promote a “School Family” atmosphere. I like to change things around. I know last summer I spent a lot of time preparing items for a Circus Theme and was planning on using the same theme for this upcoming school year. BUT I think I might have a slight case of ADD. I couldn’t stand the thought of looking at the same items for an additional 10 months. SO, I have decided to use an “Under the Sea them for my classroom. I have been busy creating cubby labels, bin labels, attendance charts, new center signs, work group pocket chart cards, a new visual schedule, posters for procedures and so much more. Below are descriptions and links to “Under the Sea” themed items from my store at TeachersPayTeachers.com. 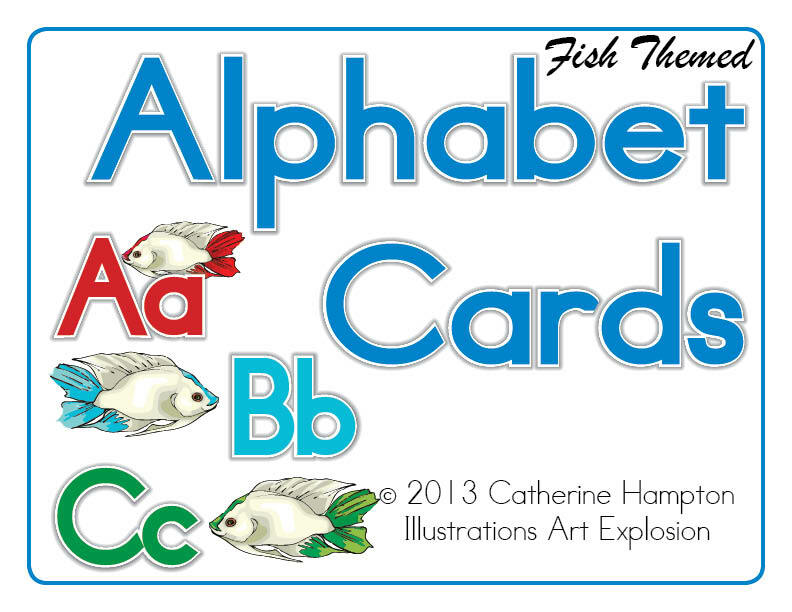 Fish Themed Alphabet cards are perfect for circle time, word wall labels, literacy centers, and so much more. Each page contains a fish with the upper and lowercase letter printed in the middle of the fish. You can use the entire page as an alphabet card or cut each fish out. Directions: I suggest all pages are printed on card stock and laminated for durability. I have provided several different sizes to accommodate the many uses you may have in your classroom. • Pages 3 to 28 are 8.5” x 11” with each letter on a separate page. • Pages 29 to 41 are 2 up on a page for an approximate 8.5” x 5.5” finished size. • Pages 42 to 46 are 6 up on a page for an approximate 3.5” x 4” finished size. • Page 47 all 26 alphabet cards on one sheet. Ideal to use in home activity folders or a quick reference for students at their desk.